How Much Do Solar Cars Cost (and Why Put Solar Panels on Cars)? Can solar panels help EV’s limited range? The electric vehicle (EV) and, to a lesser extent, the plug-in hybrid (PHEV) market suffer from what’s known in the industry as range anxiety. EV naysayers typically spout off something like, “How much does that solar car cost?” followed by, “You know you can only go 100 miles on one charge, right? What are you gonna do when you’re stuck on the side of the highway?” Are solar the answer? And how much do solar cars cost? 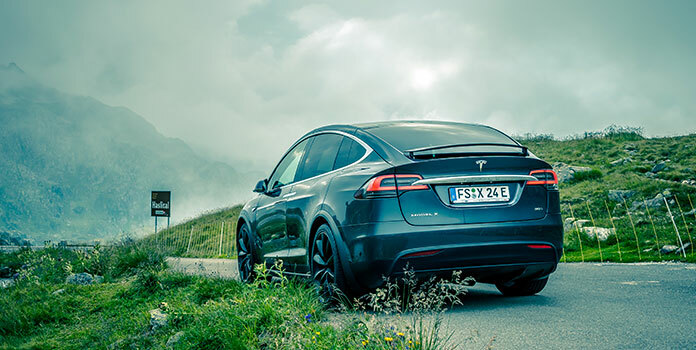 Range anxiety l- that fear of running out of power while driving – is a legitimate concern, brought on by EVs’ much shorter driving range than traditional gas- or diesel-powered automobiles. The Chevy Spark EV, for example, lasts an underwhelming 82 miles, and the Kia Soul EV lasts 93 miles. That’s barely enough for some people’s commute – though statistically, most drivers in the US drive just 37 miles a day, well below almost all EVs’ uppermost range limits. As major manufacturers start pushing more money towards research on batteries, aerodynamics, and efficiency measures for EVs, driving range is increasing. BMW’s i3 delivers 113 miles. Tesla’s EVs and Chevy’s new Bolt are pushing standards by leaps and bounds, each seeing well over 200 miles of range. But with gas-powered alternatives still regularly seeing 500 to 600 miles per tank, that EV range anxiety still exists – even if it’s not based in reality (200+ miles is more than enough for our day-to-day lives), but simply comparison to the status quo. The more clever of us might wonder if adding solar panels to electric vehicles might solve the problem. It’s an interesting question, so let’s find out! Are solar panels on cars the answer? Those strange-looking cars are specially designed to run off solar energy. They sport huge, flat roofs to fit as many solar panels as possible. They’re ultra-lightweight to reduce electricity use. They only fit one person. 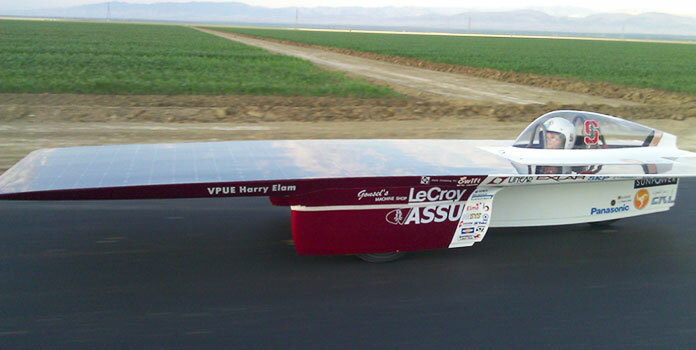 They’re also pretty slow (the world speed record for a solar-powered car is 57 MPH). This is the kind of setup that you need to have a car totally running off the sun. Not very practical, is it? That doesn’t mean that solar panels on cars is a complete wash. In fact, at least two major manufacturers are already making cars with solar panels. 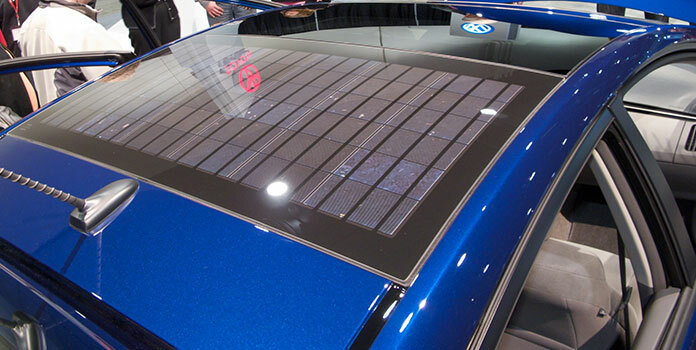 This is the holy grail of solar cars, and what everyone probably thinks of when they think about solar panels on cars. The panels are built into or permanently attached to the car. The electricity produced by the panels is used to power the electric vehicle’s driving batteries. You need a lot of solar panels to make a usable amount of electricity, and due to the extreme space limitations of car roofs, no major car company had attempted to make a car like this until late 2016, when Toyota launched its new Prius Prime (see video above). Examples: The Prius Prime won’t be available in the US, but it comes with a 180 watt solar panel to power the car’s battery bank. To be clear, other manufacturers have played with vehicles powered by solar-powered batteries, but none have moved into production. In 2009, Ford created the C-Max Solar Energi concept car, which included solar panels to charge the car batteries. Elon Musk hinted that Tesla might produce a solar car in the future, though only in a Twitter response. Read more on the Prius Prime below. EV’s have a 12-volt battery, separate from the main battery bank, that powers accessories like air conditioning, blinkers, and the radio. Usually, this accessory battery itself draws power from the main battery bank, but some solar cars, like the Nissan Leaf, include solar panels that can independently charge the accessory battery. So, while the solar panel’s electricity doesn’t aid directly in moving the car forward, the solar panel allows the accessory battery to take less power from the main bank of batteries (therefore leaving more electricity for the motor to use), increasing the range of the car. Examples: The Nissan Leaf comes with an optional solar panel. The panel produces an estimated (very small) 5 watts, so it’s really more of a gimmick than anything else – though it’ll keep your accessory battery topped up if you park in the sun all day. Toyota offered similar solar panels as an option on its 2009-2015 model Prius (featured in the picture above). The Fiskar Karma also optionally included a fairly large 120-watt solar panel, which also powered the accessory battery. 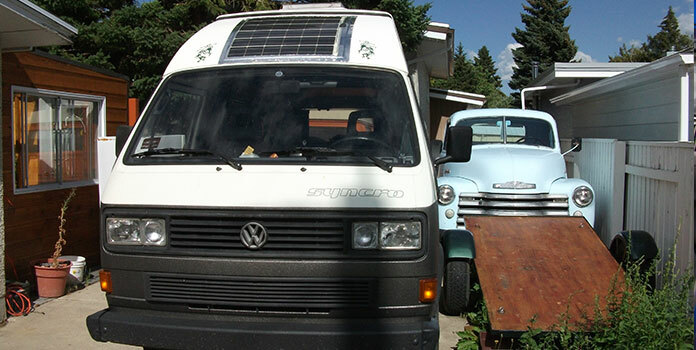 This setup is mostly used in RV’s and campervans – not EVs or PHEVs. Solar panels are attached to the roof of the vehicle and provide electricity to the leisure batteries, which power all the driver’s ‘lifestyle’ gadgets – laptop, TV, microwave, blender, hair dryer, etc. This is a completely different system which we won’t be discussing today, as we are focusing on solar panels for EVs and PHEVs powering the car or its built-in accessories. For more information on solar for RVs, see our article What are the Best Options for RV Solar Panels? How much do solar cars cost? As you can see above, there really aren’t too many options out there for solar cars. Both the Toyota Prius and Nissan Leaf are offered with solar panels, but that’s about it. And furthermore, is it worth it to pay the premium for the solar panels? To find out, all we need to do is calculate if paying the additional cost for solar panels on the roof is cheaper than continuing to purchase electricity from your utility to power the vehicle. Here we go! 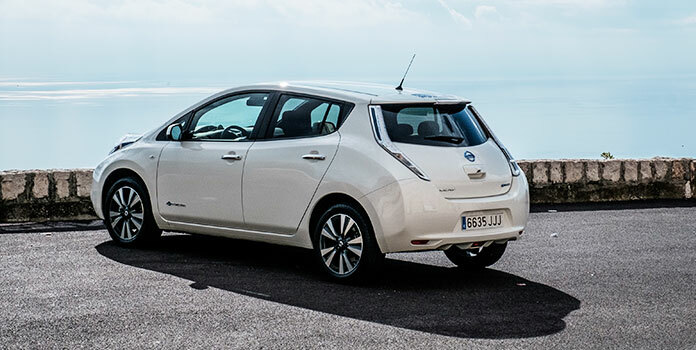 As we mentioned above, Nissan offers a small solar panel as an option for the Leaf. The panel is included as part of the most expensive trim level, so to get the solar panel on your car, it’ll cost an extra $6,110. This makes for a grand total of $36,790 for the entire car. At this trim level, you also get leather seats, fog lights, and heated back seats. Honestly, we don’t need to even do cost calculations. $6,000 for a 5-watt panel does not make sense financially. Now, if you’re after all the other extra features, by all means go for it! But if you’re only interested in the solar panel, save that money and install solar on the roof of your actual house, where $6,000 could buy you a 2,000-watt installation – literally 400x bigger than the 5-watt panel on the Leaf! And with solar attached to your roof, you could actually charge your entire vehicle with solar power – pretty cool! 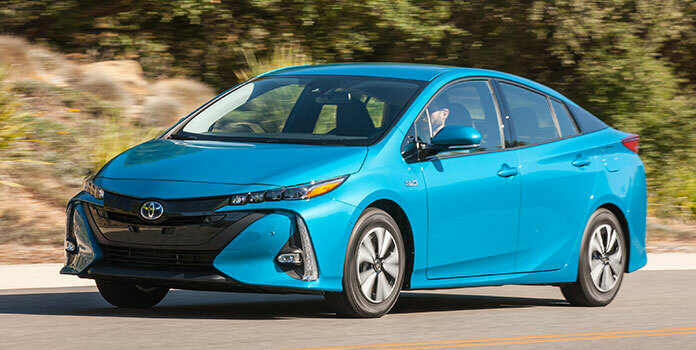 For the new Prius Prime, solar panels unfortunately won’t be an option in the US due to stringent crash test requirements, but Toyota is hoping to introduce them in the near future. Information on the price including the solar panel is scarce, but let’s perform some quick math to see how much you should pay if you want to save money. The solar panel on the Prius Prime produces 180 watts. This would produce different amounts of electricity depending on weather and location. In San Diego, CA, for instance, a 180-watt solar panel flat on a car roof should produce around 255 kilowatt-hours a year (if left in the sun all day) according to NREL’s PV Watts. With cars averaging 200,000 miles or more in their lifetime (possibly more for EVs as their electric motors generally see less wear and tear), and the typical driver traveling about 13,500 miles a year, we roughly estimate that the average car lasts 18 years. So now we need to know how much it would cost to purchase 255-kWh from the utility each year for 18 years. With the national average utility rate at $0.126 per kWh – and accounting for utilities’ average rate increase of 2.6% a year – we find that purchasing 255 kWh each year for 18 years would cost an estimated $608. And, that’s it. The 180-watt panel needs to cost less than $608 for you to break even at some point (at least in San Diego). Over the last few years, rumors of kits to add solar panels to power your EV have come and gone. First, there were Solar Electric Vehicles, which NREL even used for their EV test car. At $3,500 for a 215-watt system – you can probably do the math based on our calculations above for the Prius – it’s likely not cost-effective. Still, aftermarket solar for cars is a cool idea, though it appears that the business is now defunct. Enermotion, an efficiency company focusing on automobiles, was also working on retrofit solar kits for electric or hybrid vehicles, as you can see in the video above, but has yet to release any solar product. It seems that solar kits for EVs and PHEVs is still something the future holds. Are solar cars worth the cost? Right now, solar cars simply aren’t cost effective. But always keep in mind that money isn’t everything. If you really want to make a statement or want to contribute as much as possible to a cleaner environment – cost be danged! – go for it. You’ll be happy knowing you did. If you really want solar in your life but want to be financially responsible as well, look into installing solar on your home’s roof. It actually saves you money and you can use the electricity to charge your EV as well as power lights, your refrigerator, and anything else. Sure there are downsides – you have to drive home to charge your EV, but there are benefits as well – you don’t have to park in the sun on a hot summer day just so you can use your solar panel. Solar is an incredibly flexible technology, with more and more development every day. There are (physically) flexible solar panels, spray-on solar, and a handful of advanced, thin-film solar technologies that we’re only just beginning to scratch the surface of. 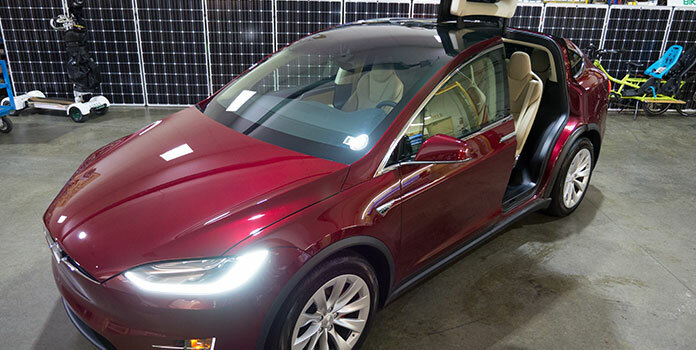 So, putting solar on cars is certainly not a bad idea. In the future, solar panels and cars will probably be a match made in heaven. We just need technology to catch up.